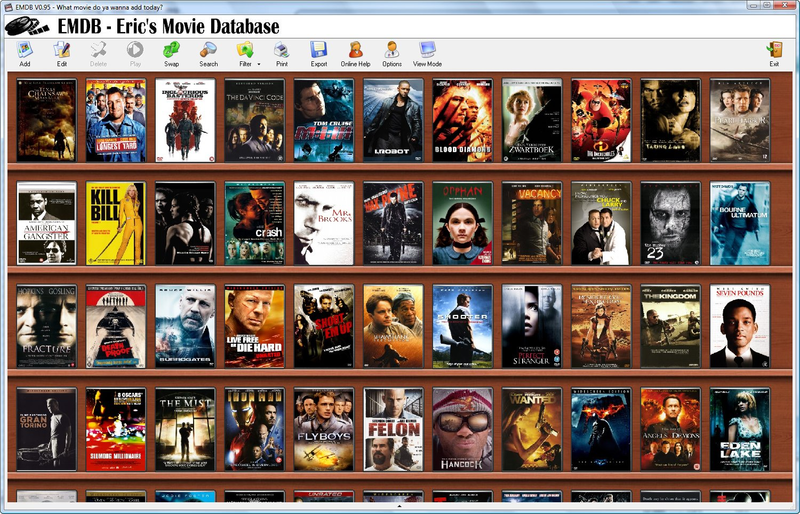 EMDB is a powerful database that makes it easy to keep track of your movie collection. How easy? To add a movie you simply enter its title, click the Search IMDB button, and EMDB will track down matching movies for you. Choose the right one and it automatically finds and fills in details like the cover art, cast, genre, director, duration and a whole lot more. You can then customise the entry with a rating, or more specific information about your copy. Like, is it a VHS tape, DVD, Blu-ray disc, something else? Is it a PAL, SECAM or NTSC copy? Which region is it? And the list goes on. Or, if you're in a hurry, you can just click OK and add this particular movie to your collection. Which is very nicely displayed, with your movie cover art images laid out on a virtual shelf (although you can also opt for a more ordinary text-based list, if you like). Once you've finished then the database can have several possible applications. You're able to use it to track movies you've loaned to others, for instance. Or to create Wish Lists of movies you like, but just haven't got around to buying yet. And if you've a particularly impressive collection, then the Export option will allow you to save its details on HTML pages, ready for uploading to a website and sharing with the world. - General: Fixed a crash at startup for some users. - User Interface: Improved update of list / bookshelf if a single movie is edited. - Add Movie: Fixed inserting movies. - User Interface: Fixed clicking on an actor in the cast overview should show all movies the actors appears in. - Translations: Updated the German, Simplified Chinese, Slovenian, Arabic and Dutch translations.